Alloy Wheels, Colour Coded Bumpers, Colour Coded Mirrors, Rear Wash Wipe, Tinted Glass, Air Conditioning, Immobiliser, Central Locking, Cruise Control, Electric Mirrors, Electric Windows, Power Assisted Steering, Radio CD, Service History, Low tax / Insurance, Warranty, Sports Model, Panoramic Roof,,2008 58 Peugeot 207 Sport Cielo 1.4, 3 door hatchback, gleaming silver with contrasting sports cloth trim, Panoramic Glass Roof, Bluetooth Phone Connectivity, Cruise control, Alloy wheels, Air Conditioning, CD Player, Electric Front Windows, Electric door mirrors, Remote central locking, Power steering, Front Fog Lights, Trip Computer, Isofix, Folding rear seats, Height adjustable drivers seat, Immobiliser, Drivers, Passenger and Side Airbags.This car comes to you Serviced, Mot'd and with a Comprehensive Parts and Labour warranty, Roadside Assistance and Recovery package as ***petitive Finance Packages available, All major Credit and Debit cards accepted. This advert is for a Peugeot 207, click Peugeot 207 in Darlington to see more cars like this in the local area. Want to search further afield? 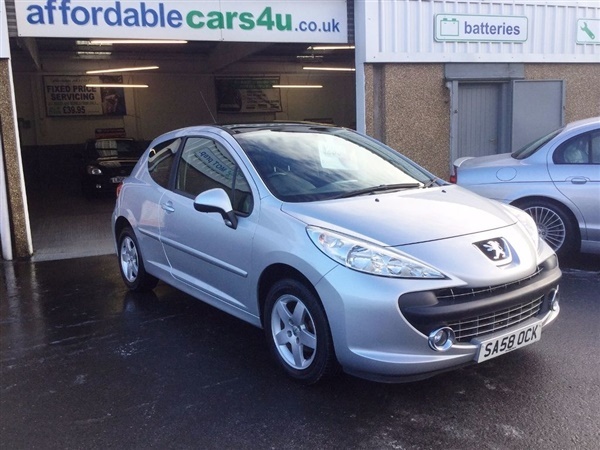 Click Peugeot 207 in County Durham to search for similar cars in the wider County Durham area.